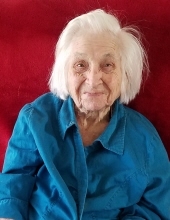 Dorothy Marchman, age 99 of Texas, formerly of Carrollton, Georgia, passed away April 2, 2019. She was born August 31, 1919 in Bessemer, Alabama, daughter of the late Bill Houston and Ada Pilgrim Houston. She was a homemaker and a member of Pumpkinvine Church but due to her failing health, she was no longer able to attend. In addition to her parents, she is preceded in death by her husband, James W. “Bill” Marchman. Survivors include her daughters, Linda Echols of Bedford, TX, and Jeanne Crawford of Winston Salem, N.C.; three grandchildren, Faron Robinson, Julie Echols Dale, and Russell Echols; and five great grandchildren. Graveside service will be conducted Wednesday, April 10, 2019 at 11:00 AM from Carrollton City Cemetery with Rev. Jimmy Bryan officiating. Messages of condolences can be sent to the family at www.martin-hightower.com . To send flowers or a remembrance gift to the family of Dorothy Marchman, please visit our Tribute Store. "Email Address" would like to share the life celebration of Dorothy Marchman. Click on the "link" to go to share a favorite memory or leave a condolence message for the family.